On July 1, 1893, the Secretary of the Interior appointed Walcott Geologist-in-Charge of Geology and Paleontology. In the spring of 1894, Powell told the House Committee on Agriculture, then considering legislation to transfer the Geological Survey from the Department of the Interior to the Department of Agriculture, that although the Geological Survey when it was organized was supposed to be concerned principally with mines and mining, the bulk of its operations were now concerned with agriculture. The Secretary of the Interior requested a cut in Powell's salary, a device used by the administration to embarrass officials and force their resignation, and Powell submitted his resignation in May 1894. The Secretary of the Interior promptly recommended to President Grover Cleveland the appointment of Walcott as the third Director of the U.S. Geological Survey. Walcott was not an obvious choice for the position in view of the congressional desire for more emphasis on economic geology. He was a man of unusual administrative and scientific ability, but, although he had already established an international reputation in what he chose to call paleontologic geology, as late as 1890 he was one of the lower-paid paleontologists and in 1892 had been on the verge of leaving the Survey to become a professor at the University of Chicago. Walcott, however, had been one of King's early appointees, as an assistant geologist at $600 a year, and had been part of the group that worked with King in New York after King's resignation as Director. Walcott understood the difficulties the Geological Survey faced and the steps that had to be taken. In fact, in the request for funds that was sent to Congress in December 1892, the purpose for which the geologic surveys were to be made was changed from "preparation of the geologic map"17 to "locating and representing by maps, sections, and reports,"18 the various mineral resources known or believed to exist in 17 different areas, including those in the Eastern States. Walcott's appointment was greeted with cautious approval by geologists but more or less ignored by the mining fraternity, although King assured them of his administrative ability. Walcott revived the mission orientation of the Geological Survey as outlined by King in 1879 but broadened the mission beyond that envisioned by King. The Survey would aid not just the mineral industry but all industries--in fact any practical objective that could be aided by a knowledge of geology. It would not, however, be limited to practical geology but would undertake basic research whenever research was necessary in the solution of a geologic problem. Walcott abolished all organizational units within the Geologic Branch and assumed direct control of the work. Mining geology studies were resumed and extended into the Eastern States, and in view of the gold crisis, an intensive study of gold deposits, including exploration for new sources, was begun. The deposits at Cripple Creek, Colorado, a little-understood telluride ore, were studied, as were those at Mercur, Utah, which had become usable through development of the cyanidation process. Studies of gold deposits in Alaska began in 1895. By 1900, the value of gold produced annually in the United States was more than twice what it had been in 1890, and the United States adopted the gold standard as its monetary base. The mining-district studies were not restricted to gold but were also undertaken in the iron districts of Michigan and Minnesota and the copper districts of Montana, Utah, and Arizona. Nor were they held to practical matters only. By 1900, the ideas on the classification and genesis of ores, which King had hoped would come from the mining geology program, were matters of intense discussion; papers on these topics at the meeting of the American Institute of Mining Engineers in 1901 became landmarks in the history of geology. Basic science was an integral part of the Geologic Branch program. Fundamental studies were made in the genesis of ore deposits, in paleontology and stratigraphy, in glacial geology, and in petrography. The geologic time scale was revised, new definitions for rock classes were developed, and the first geologic folios were published. Geology was also extended to include the study of water. In 1894, a small appropriation was obtained for the purpose of "gauging the streams and determining the water supply of the United States. "19 Streamflow measurements begun during the Irrigation Survey had been continued in a modest way as part of the topographic mapping program after the Irrigation Survey was discontinued in 1890. With the new appropriation, work was expanded. In 1895, the work was transferred to the Geologic Branch, and studies of underground water and water utilization were gradually added to the stream gaging. Appropriations were increased regularly, and in 1896 a new series of publications was inaugurated to make available the ever-increasing volume of information. The Irrigation Congress that met in Phoenix in December 1896 reversed the opinions of earlier congresses with regard to the Geological Survey's role in public-land management by recommending establishment of a Public Lands Commission, including the Director of the Geological Survey as a member, to be responsible for preparing a topographic map, determining the water supply, ascertaining the character and value of the timber, and making regulations for the occupation and utilization of the public lands. The development of the topographic work followed a similar pattern. Before Walcott became Director, the work of the Topographic Branch of the Survey had been criticized by many who considered the extensive program inappropriate for a geological survey and more properly part of another organization, but at the beginning of his directorate Walcott simply announced that topographic map quality would be improved. Within a few months, the topographic corps was placed under Civil Service, thus eliminating some of the difficulties of the Powell era when many with inadequate or no training, including congressional relatives, had been employed. A practical demonstration was made of the advantages of combining topographic surveys and the subdivisional surveys of the General Land Office in Indian Territory. The value of topographic maps for practical purposes was greatly increased by the placement of permanent bench marks showing the exact location and elevation of fixed points. By 1897, Walcott had regained the confidence of Congress. The Forest Management Act that year placed management of the forest reserves in the Department of the Interior and required that surveys of the "public lands that have been or may be designated forest reserves"20 be made under the supervision of the Director of the Geological Survey. Survey topographers within the next 3 years mapped more than 32,000 square miles in and adjacent to the reserves, even though most were in wilderness areas. At the same time, a program of topographic mapping on the larger scales needed for more urbanized areas was steadily growing in cooperation with the Eastern States. In the late 1890's, geologic work was extended into new fields and went beyond the national domain. In 1897, a Survey geologist and a hydrographer were detailed to the Nicaraguan Canal Commission to study the proposed canal route between the Atlantic and Pacific Oceans. The Commission made extensive use of their findings, marking perhaps the first time on this continent that geological evidence provided support for a great engineering project. After the Spanish-American War in 1898, Survey geologists were sent to investigate the mineral resources of Cuba and the Philippine Islands. In 1897, a Senate resolution called for a three-man commission, including the Director of the Geological Survey, "to determine the best method of ascertaining all the facts of general importance relating to mines and mining within the United States, whether by a mining bureau, a Secretary of Mines and Mining, a Commissioner of Mines, or a commission. "21 In December 1898, a Senate resolution called for a Division of Mines and Mining in the Geological Survey to gather statistics on mineral resources and mineral production and to make investigations related to mines and mining. Walcott agreed that the mining interests should be represented in the organization of the Government and that establishing such a division would care for the interests of the mining industry. He added that, in addition to precious metal investigations, studies should be undertaken of coal, coke, petroleum, asphalts, building stones, and clays. In 1900, a bill for establishment of a Department of Mines with the Survey as a nucleus was filed but not acted on. However, when Congress appropriated for the Survey 110 percent of the amount it had requested, the Geologic Branch was reorganized, and a Division of Mining and Mineral Resources was established. The reorganization of the Geologic Branch on July 1, 1900, was an experiment designed to separate scientific and administrative control. Seven divisions were established, covering specified subject areas, each in charge of a specialist who would prepare plans of work, establish priorities, recommend geologists to undertake particular projects, and review manuscripts. Party chiefs would plan the conduct of the work. The Director would approve plans and make allotments. In essence, it was King's plan of 1879 adapted to a larger organization. At the time, Federal science was clearly enjoying a new but somewhat hazardous status. While becoming more involved in the economic life of the Nation, it was at the same time tending more and more toward the practical, so Washington scientists were seeking private funds to support basic research. In May 1901, the Board of Trustees of the Washington Memorial Association, of which Walcott was president, was incorporated "to promote science and literature; to provide opportunities and facilities for higher learning, and to facilitate the utilization of the scientific and other resources of the government for purposes of research and higher education,"23 and a plan for a nongovernmental institution to promote the study of science and liberal arts in Washington was developed. The trustees conferred with Andrew Carnegie, who agreed to endow the Carnegie Institution of Washington for the purpose of "extending human knowledge by original investigations and research. "24 The trustees of the new institution, of which Walcott was Secretary, defined the limits of research as the limits of the knowable, and concluded that the function of the institution should be the substitution of organized for unorganized effort whenever it promised the best results, and the prevention of needless duplication of work, pointing out that no investigator, working alone, could approach the largest problems in the broadest way thoroughly and systematically. The accession of Theodore Roosevelt to the Presidency in September 1901, after the assassination of President William McKinley, very quickly had an effect on the Survey program. By inclination and training, Roosevelt was in full sympathy with the movement for scientific management of the Nation's resources, and in his first State of the Union message, in December 1901, outlined a national forest and water policy. The long effort to promote reclamation of the arid lands, with which both Walcott and F.H. Newell were associated, culminated in passage of the Newlands Act in June 1902 and the establishment of the Reclamation Service. At the same time, the appropriation for the Geological Survey's water-resources investigations was increased and the total appropriation for the Geological Survey for the first time was more than $1 million. At the direction of President Roosevelt, the Reclamation Service became an adjunct of the Geological Survey, and Walcott served as director of both agencies. The organization of the Geologic Branch was again altered when Walcott assumed additional duties as Director of the Reclamation Service and Secretary of the Carnegie Institution of Washington in 1902. Administrative control of five divisions was transferred from the Director to the Geologist-in-charge of Geology and Paleontology, and those five divisions became sections in the Division of Geology and Paleontology. The Division of Physical and Chemical Research and the Division of Mining and Mineral Resources remained under the administrative control of the Director. The Hydrographic Division was separated from the Geologic Branch and became the Hydrographic Branch. In 1903, the Division of Alaskan Mineral Resources, in effect an Alaskan geological survey because it included topographic mapping, was established in the Geologic Branch. Federal science had then become so involved in the economic life of the Nation that inevitably it also became caught up in the making of national policy. The Geological Survey through its Director had had a hand in the passage of the Forest Management Act in 1897 and the establishment of the Reclamation Service in 1902. Shortly thereafter the Geological Survey also became involved in the regulation of industry. When the coal resources of the Nation became a matter of public interest because of the hardships endured during the prolonged anthracite coal strike in 1902, President Roosevelt appointed a commission, including among its members the Survey's coal statistician, to arbitrate the dispute. The commission in its report was critical of the rivalry between railroads, which owned or controlled more than 96 percent of the anthracite deposits, of wasteful methods of mining, and of mining safety practices, and the Commissioner of Corporations in the newly established Department of Commerce and Labor promptly began an investigation of some of these problems. Early in 1903, President Roosevelt also appointed the Director of the Geological Survey chairman of a committee to investigate the scientific work of the Government to increase its usefulness, efficiency, and economy. The committee concluded that, in general, the work of scientific research on the part of the Government should be limited primarily to utilitarian purposes and that research in pure science on broad and general grounds should be within the scope of private institutions. The committee favored organization of research around a problem rather than a discipline, and recommended the transfer of several bureaus, including the Geological Survey, to the Department of Agriculture, which already included one-third of all Federal scientific bureaus, received three-fifths of all appropriations for scientific work, and employed two-thirds of all Federal scientists. No action was taken on these recommendations but at the time President Roosevelt was much involved in foreign affairs, including negotiations for the isthmian canal and Alaskan boundary problems. In 1904, the U.S. Geological Survey celebrated the 25th anniversary of its establishment. It had grown from an organization of 38 employees at the end of its first year to one with 491 employees (and another 187 in the adjunct Reclamation Service) in 1904. Its first appropriation had been $106,000; the appropriation for the fiscal year that ended on June 30, 1904, was $1.4 million. 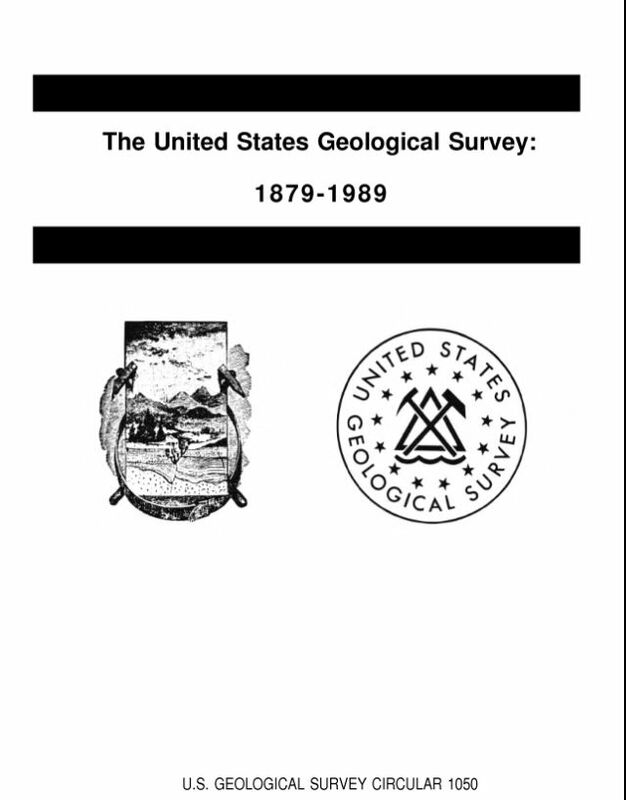 It had become the leading geologic institution in the United States in the view of "American Men of Science," and many of the 100 geologists whose work was considered most significant by their peers, including the first five ranked numerically, were associated with the Survey. To mark the anniversary, a bulletin describing the Survey and its operations during the 25 years was published. Among the achievements noted were preparation of topographic maps of 929,850 square miles of the United States (26 percent of the country including Alaska) published as 1,327 atlas sheets; geologic mapping of 171,000 square miles and publication of 106 geologic folios; experimental and theoretical investigations of the physical characteristics of rocks in various processes of formation, of volcanic and geyser action, and of rock composition and structure; paleontologic and stratigraphic studies; streamflow measurements and their analysis, which, among other things, had stimulated the development of water power, especially in the Southern States; and studies of irrigable lands and detailed examination and classification of 110,000 square miles of the forest reserves. Of all the work of the Geological Survey, the bulletin concluded, its immediate value to the people was best shown by the aid extended in developing the mineral resources and in forwarding important engineering projects in which the people, as well as Federal and State Governments, were interested. Singled out for special mention were the investigations of the mining geology of Leadville, of the Lake Superior iron ores, and of the Appalachian coal field. In 1904, as the U.S. Geological Survey began its second quarter-century, the United States was in the early stages of a period of profound change just as it had been when the Survey began in 1879, but many of the problems facing the Nation in 1904 were very different from those of 1879. During the Survey's first 25 years, the United States had become an urban industrial world power. The population had increased from 48.9 million in 1879 to 81.8 million in 1904. The number of manufacturing establishments and the value of manufactured products had more than doubled during this period, and the value of the mineral products had increased from $365 million in 1879 to more than $1 billion in 1904. At the same time, settlement of the West had proceeded so rapidly that by 1890 the frontier had disappeared. During this age of change, which began in the early years of the century, national policies that had prevailed in the late 19th century were abandoned, social and economic reforms were enacted, and the role of the Federal Government was developed. In fact, the whole fabric of American life was altered. More than one historian has noted the correlation between this period and changes in the use of energy. Whether or not changes in the use of energy affected American mores, clearly they affected the development of natural resources, especially the fossil fuels and water, and these in turn resulted in changes in the geological sciences. The most obvious change was the increased interest in nonmetalliferous resources, including the fossil fuels. For several years, the Geological Survey had been reporting that an increasing proportion of the value of the annual mineral production of the United States was being contributed by the nonmetalliferous resources. In 1898, when problems began to develop in the coal industry that caused consumers to turn to other kinds of fuel, Director Walcott had suggested to Congress that a thorough investigation, including practical tests, be made of the coals and cokes of the United States so they might be used to the best advantage, in his own way echoing King's statement in 1880 that mineral resources should be used with the utmost scientific economy. In 1901, oil became a major Survey interest after the successful drilling of a well at Spindletop, 20 miles southeast of Beaumont, Texas, inaugurated a new era in the oil industry. At the World's Fair in St. Louis in 1904, celebrating the centennial of the Nation's first great acquisition of western territory, the Geological Survey was given an opportunity to demonstrate the value of the more comprehensive investigations of coal and coke, which it had been proposing for many years. For the department of mining and metallurgy at the exposition, which the Survey had agreed to organize, appropriations totaling $60,000 were obtained for analyzing and testing coals and lignites "to determine their fuel values and the most economic method for their utilization for different purposes. "27 The coal-testing program almost immediately began to produce significant results, and after the fair was over, it was extended and became part of the regular Survey program. At the same time, a similar program for the testing of structural materials was begun. Construction of large public works by the Reclamation Service and the Panama Canal Commission, among others, made the program Walcott had proposed in 1898 of immediate value. In 1905, the Survey also obtained additional funds to increase its field investigations of iron and coal, the staples of industry, about which there was some concern, and a new program of mapping western coal deposits was started. As the emphasis in the Survey's program in economic geology shifted to nonmetallic resources, specifically fuel resources, a new Section of the Geology of Fuels was set up in the Geologic Branch. On March 7, 1904, just 4 days after the Survey celebrated its silver anniversary, the Second Public Lands Commission, appointed in October 1903, submitted its preliminary report. The Federal Government, 118 years after the Land Ordinance of 1785, still held title to 1 billion acres of public lands, most of which, as in 1879, were west of the Mississippi River. President Roosevelt had asked the Commission to report on the condition, operation, and effect of the land laws and to recommend such changes as were needed to effect the largest practicable disposition of the public lands to actual settlers, requests not unlike those Congress had made of the Commission of 1879, but he had also asked that the Commission recommend changes in the public-land laws "to secure in permanence the fullest and most effective use of the resources of the public lands. "28 The recommendations in the preliminary report bore chiefly on the control, use, and disposal of forest lands and the control of water, and no consideration was given to the mining laws even in the final report although the Commission recognized that changes were necessary. In the spring of 1905, Congress transferred the management of the forest reserves from the Department of the Interior to the Department of Agriculture. The classification of the forest reserves was then transferred from the Geological Survey to the newly renamed Forest Service. As the Reclamation Service was becoming less dependent on the Geological Survey and would become independent in 2 years, by the middle of 1905, most of the public-land management responsibilities had been shifted from the Geological Survey.